This simple little pattern makes a wonderful 3-dimensional snowflake ornament. The only materials necessary are a sheet of 7-count plastic canvas and a skein of variegated yarn, preferably some combination of white and blue. 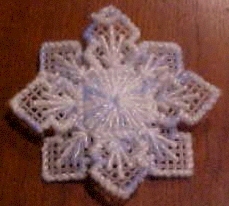 The sample shown in the picture uses a blue, white, and silver variegated yarn. 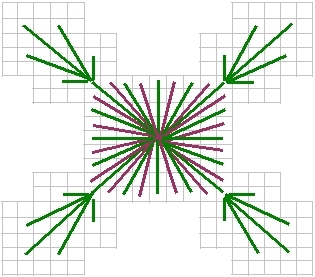 Cut out two snowflake shapes using this guide. Using the variegated yarn, stitch each piece as shown. Overcase all edges with the same yarn. Turn one piece a quarter turn and place over the other piece with the wrong sides together, as shown. 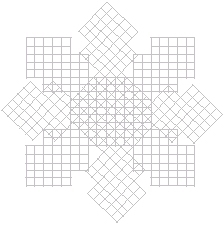 Carefully push each corner of the top piece between the two corners of the bottom piece to create a three-dimentional snowflake. In one corner, sew in a loop for hanging. 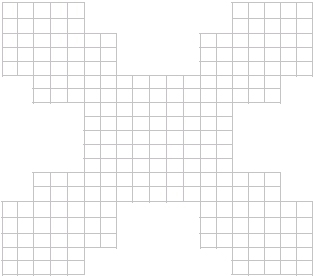 Click here to open this pattern as a printable PDF file. Right click to download the PDF file.